Townsend Bell and A.J. 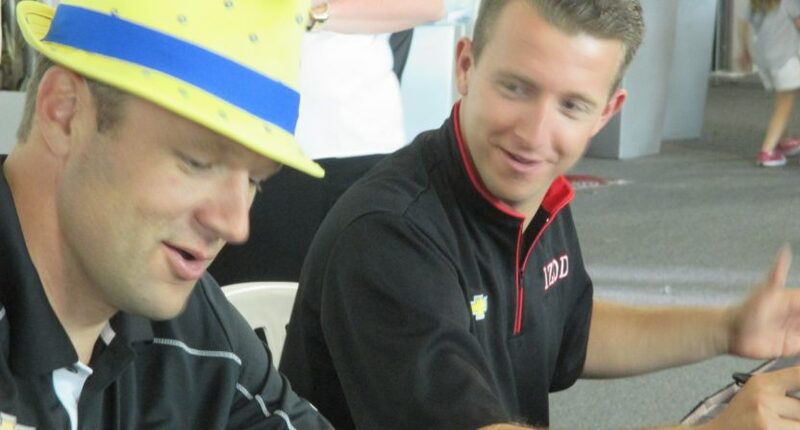 Allmendinger will be teammates off the track and competitors on the track. The Rolex 24 at Daytona is this weekend and there’s a different buzz around the speedway. This may be the most competitive field in the history of the race and there are so many personal stories that are appealing to the racing and non-racing fan alike. For instance, there’s the inspirational story of Alex Zanardi. After losing both legs in a horrific crash, Zanardi continued racing and winning. Zanardi went into touring cars and became a handcyclist and triathlete, winning the 2011 New York City marathon and four Paralympic gold medals in handcycling. The 52-year-old Zanardi is entering his first Rolex 24 at Daytona, competing in the GTLM class with the #24 BMW M8 GTE with BMW Team Rahal Letterman Lannigan. Using a setup where he can accelerate/upshift with the steering wheel and brake/downshift with the shifter, Zanardi is able to race while his co-drivers are able to race with the typical pedal sequence. It will be a bit more difficult for Zanardi because he’ll need to rapidly decelerate and turn a race car with one hand on the steering wheel, but a little bit of adversity has never gotten Alex down in the past. There’s also the all-female team led by Indy 500 veterans Katherine Legge, Bia Figueiredo (AKA Ana Beatriz), and Simona de Silvestro, along with two-time GTD champion Christina Nielsen. Owned by Air Force veteran and racer Jackie Heinreicher and partnering with Michael Shank, with sponsorship from Caterpillar, this team is not only competing at Daytona, they’re running the entire IMSA WeatherTech Sports Car Championship season in the competitive GTD division. The first all-woman team since 1967, this team has the financial backing, the team personnel, and the car to win their class. In preseason testing at the Roar Before the 24, Beatriz topped the GTD class in their #57 Acura, earning the team top choice in pit and garage. If they can avoid the kinds of issues many teams face throughout the 24 hours, it’s entirely possible to see these women in victory lane. On the broadcast side, a new network has the rights to broadcast the Rolex 24 at Daytona. NBC is making its debut in the IMSA WeatherTech Sports Car Championship, and they’re pulling out all the stops. The majority of NBC’s NASCAR and IndyCar broadcasting crews will be on the air periodically throughout the race. In addition, the regular IMSA crew of Leigh Diffey, Calvin Fish, and A.J. Allmendinger will call the start and finish. It’s physically taxing to just drive off-and-on for 24 hours, but Allmendinger and IndyCar analyst Townsend Bell will be taking the extra step by working the NBC broadcast and racing as competitors. Allmendinger will drive the #86 LaSalle Solutions / Curb Records Acura NSX GT3 with Meyer Shank Racing. Bell is in the same class as Allmendinger, who will drive the #12 AIM Vasser Sullivan Lexus RC F GT3 in the GTD class. Bell, who’s led at the Indianapolis 500 and has a class win at the 24 Hours of Le Mans, is really looking forward to the experience. The broadcast is set to start at 2 PM ET Saturday on NBCSN with a 3 PM green flag followed by a 3 PM checkered flag on Sunday. While it’s subject to change based on whether or not they’re in their respective cars, Allmendinger is set to be on the broadcast from 2-5 PM and 9-midnight on Saturday, and from 9 AM-3 PM on Sunday. Bell will be on from 5-9 PM on Saturday and 9 AM-3 PM on Sunday. It’s going to be an exciting race. Last year’s race broke the record for longest distance covered by a race winner (2,876.85 miles), and the qualifying record has been broken this year, so there’s a chance this year’s winner will go even further. Plenty of NASCAR and IndyCar stars like Austin Cindric, IndyCar champ Simon Pagenaud, Indy 500 champ Alexander Rossi, and former Rolex 24 champs Scott Dixon and Sebastien Bourdais are competing this year. In addition, Fernando Alonso is back as he preps for the rest of the World Endurance Championship season and attempts to become the second driver to complete the “Triple Crown of Motorsport” with a win at the Indianapolis 500.